Who is Taking on Domestic Violence? Taking on Domestic Violence recently completed the Research and Business Development Center’s (RBDC) 13-week Startup Academy program. 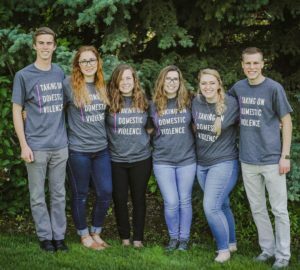 Taking on Domestic Violence, which placed third at the Rexburg Business Competition, is a non-profit with the goal to stop domestic violence before it starts. Their message targets youth, teaching them indicators of unhealthy behaviors in relationships that can develop into actual violence if left unchecked. How did Taking on Domestic Violence get Involved with the RBDC? Taking on Domestic Violence began as a class project for a design thinking course at Brigham Young University-Idaho. Mitchell Taylor, the founder, explained that the more the group learned about domestic violence, the more passionate they became to stop it. That’s why after the design thinking class ended, Taylor and some others from the group decided to turn their project into something real. That’s how Taking on Domestic Violence became involved in the RBDC’s Startup Academy. They came to the RBDC with their first donation and idea for a non-profit that could stop domestic violence before it ever happened. The RBDC’s Startup Acadamy is designed to help entrepreneurs turn their ideas into real, successful business by providing resources, mentorship, and training. Using resources and connections made through Startup Academy, the young business was able to file for incorporation and 501(c)(3) status. The RBDC pushed the team to create a comprehensive business plan and narrow in on their target market, which they did. During the 13 weeks, Taking on Domestic Violence developed a logo and website, created and sold merchandise, conducted secondary research and consulted experts to develop curriculum to present to youth. Among many other things, they also piloted their curriculum presentation and lined up their first school presentation for Fall 2017. Taking on Domestic Violence described their time at Startup Academy to be invaluable to them. The Taking on Domestic Violence team thoroughly impressed the RBDC with their dedication, hard work, and passion for their cause. The RBDC wishes them the best as they move on from its program! The RBDC is a 501(c)3 non-profit organization.